Kiwi Box are the South Island's largest specialist supplier of refrigerated storage containers. They provide out-of-the box customised storage solutions for clients by utilising second hand shipping containers which can be purchased or leased. 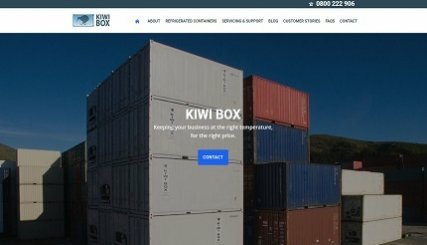 With their vast experience as qualified refrigeration engineers, Kiwi Box pride themselves on customising the right storage container to suit their customers’ unique needs. They also offer regular servicing and support of their leased containers, including a prompt 24/7 breakdown service. Limelight took over the hosting our website a few years ago now. Our website was starting to look dated and not particularly easy to negotiate, so the decision was made to create a new one that was mobile friendly and easier to get the information our customers needed for hiring or buying one of our refrigerated shipping containers. We contacted Suzanne from Limelight and had a meeting to go over ideas of what our new website could possibility look like. Our ideas were put to the main design team and they came up with a great design that we are very happy with.